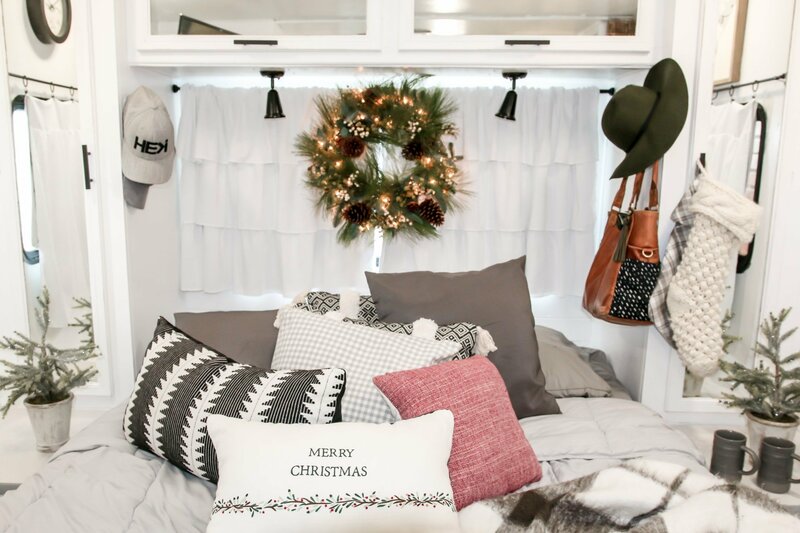 I’m thrilled to be joining the Seasonal Simplicity Home Tour today to share my Christmas decor in our RV! Be sure to click on the links at the bottom to visit each of the other homes on our tour today! A special welcome if you are stopping by after visiting Summer Adams. 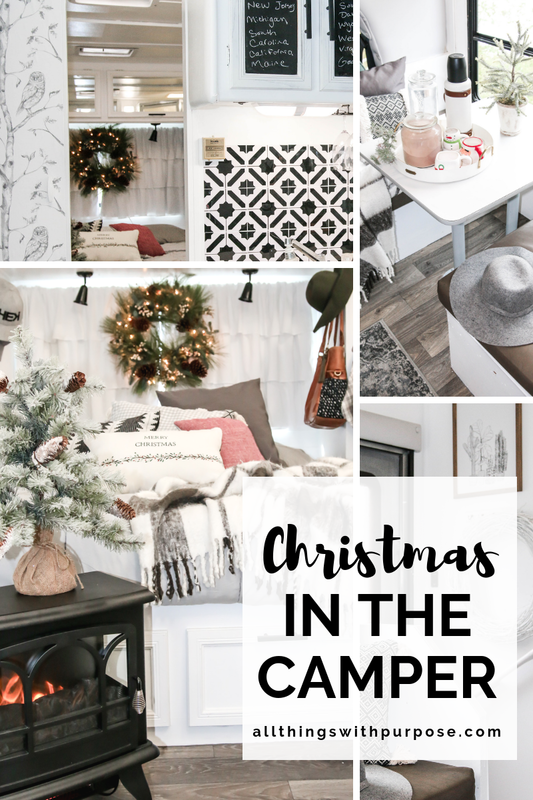 Welcome to my Christmas Home Tour – Camper edition! 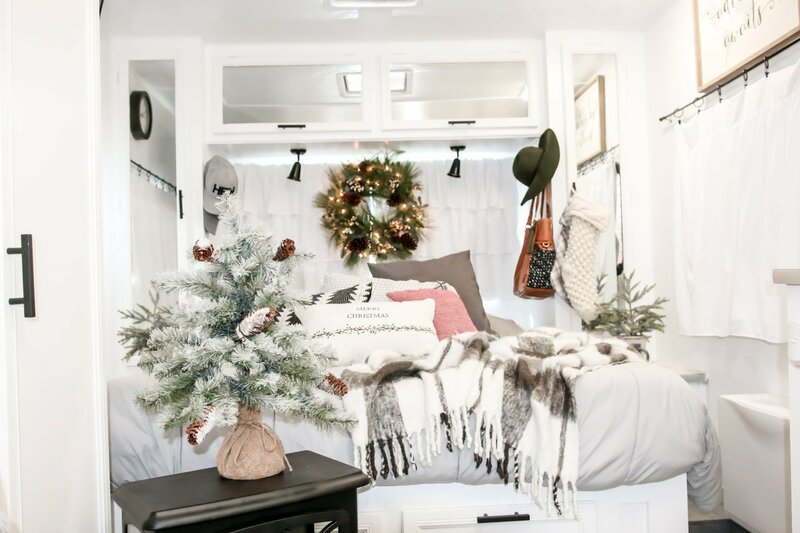 I was so excited to decorate this spot for Christmas and I just had to share it with you. 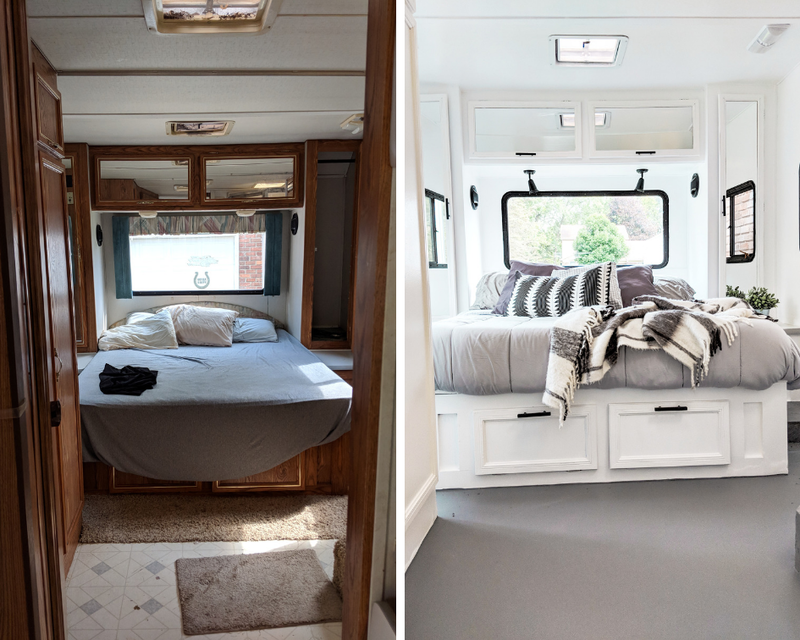 This is the 5th camper we have purchased in the past few years and fixed up. They have each been a labor of love, and the only thing that keeps me motivated is the dream of enjoying the end project as a family! 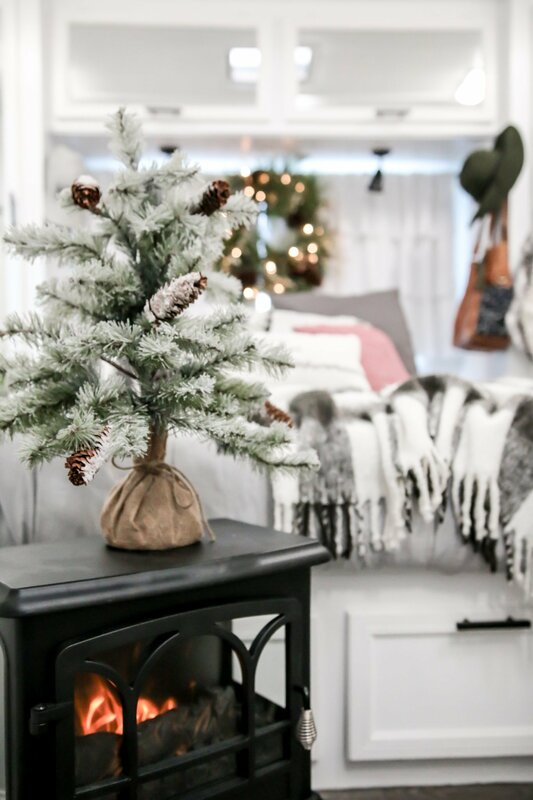 I love the warm, cozy feel of these flocked trees, lights, plaid blankets, pillows and the little fireplace heater. 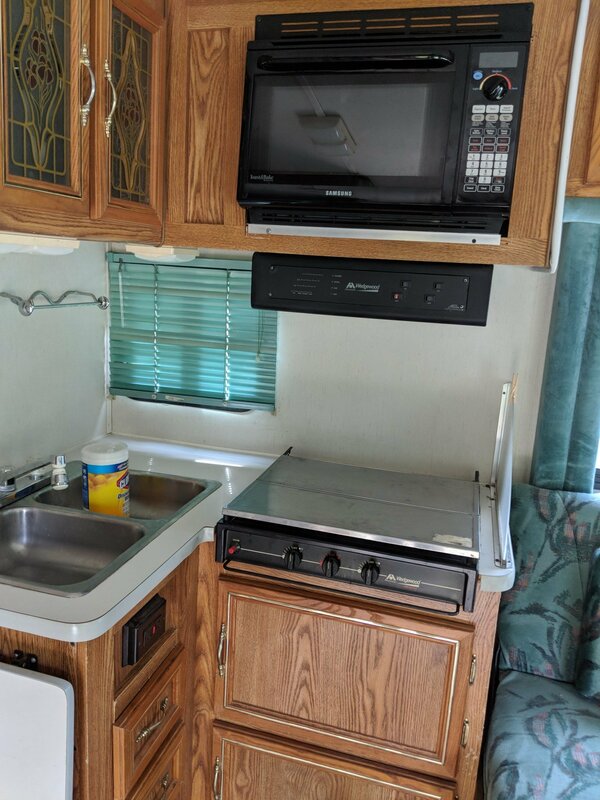 In my last trailer, we had found a small, wall mountable electric fireplace. 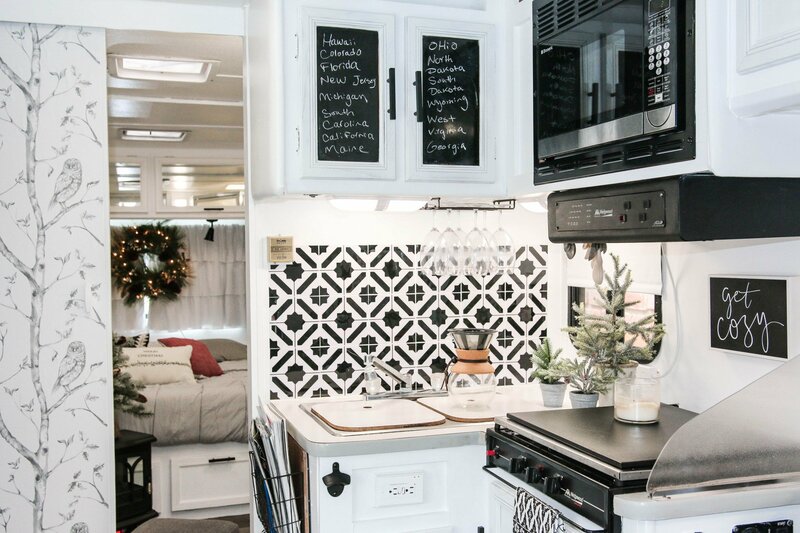 This RV didn’t have the wall space, but this little unit from the Home Depot works great. 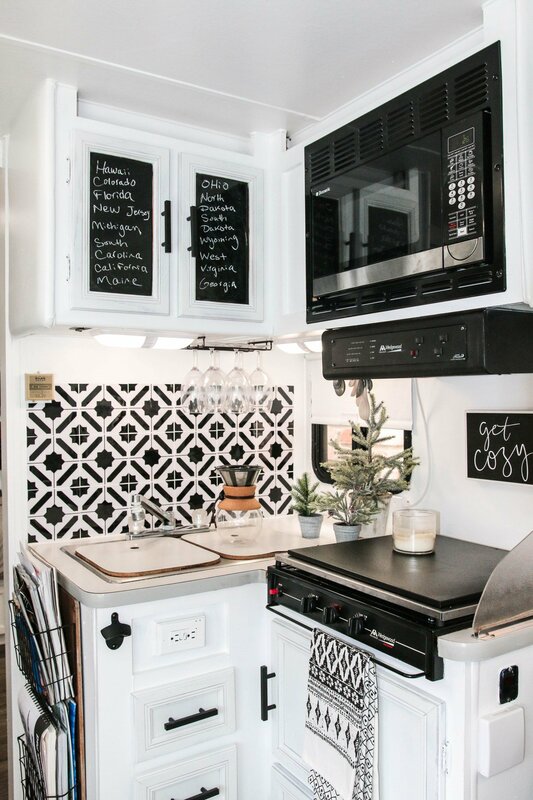 It provides an electric heat option instead of using gas, and it looks cute! Now, before I go on, I think I need to share a before picture of this space for you to fully appreciate how amazing it really looks. I’ll be sharing more before and after posts in the near future. With everything going on, I’ve fallen behind in sharing all the finished touches. If you follow me on instagram you may have seen the progress in my stories! Now, what’s going through your head? If you’re thinking there is no way on earth you would step foot inside this RV let alone, sleep in it… well, I’m right there with you. This camper was the stuff of nightmares (which, oddly enough, has been the case for most of my trailer renos). I stripped this baby down and dragged out anything made of fabric; including the mattress, curtains, carpet and valances. It took about a month of almost full-time work to get her where she was usable. There is still a lot of work left and things on my to-do list, but that will have to wait until the Spring! Here is a BEFORE picture of the kitchen, for side-by-side comparison! The next home on our tour today belongs to Krista, the Happy Housie. Be sure to visit her home and say “hi” for me! Did I miss what the total cost of the renovations was? 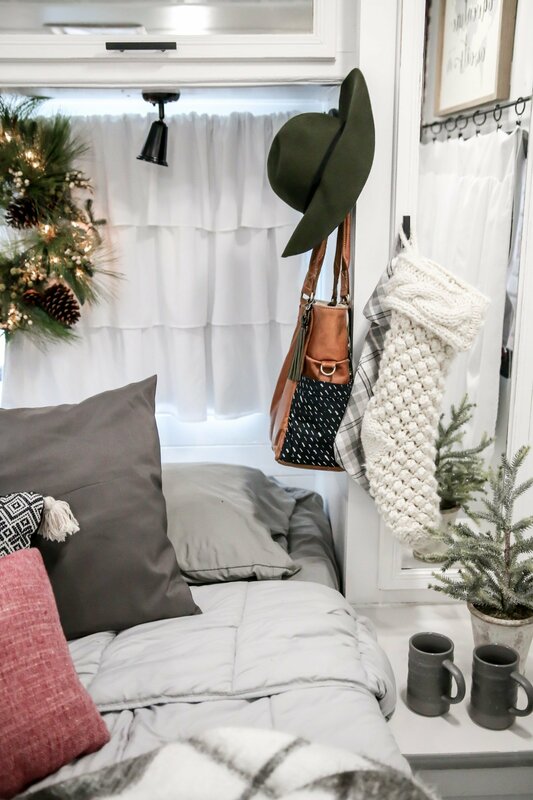 And without the decorating items like pillows and bedding? I didn’t see anything but the initial estimate of $3500. Hi Lee! 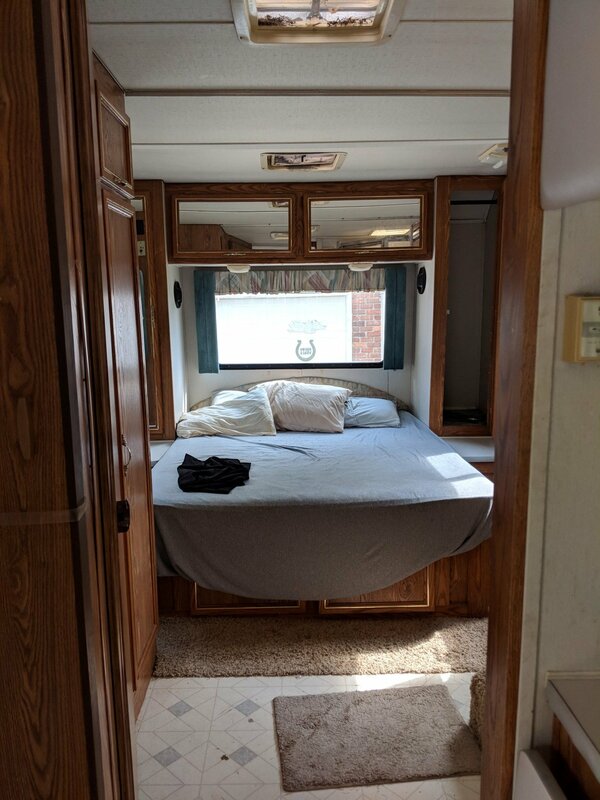 We purchased the camper for $3,500 and the total cost to renovate (including new tires) was just about $2,000. 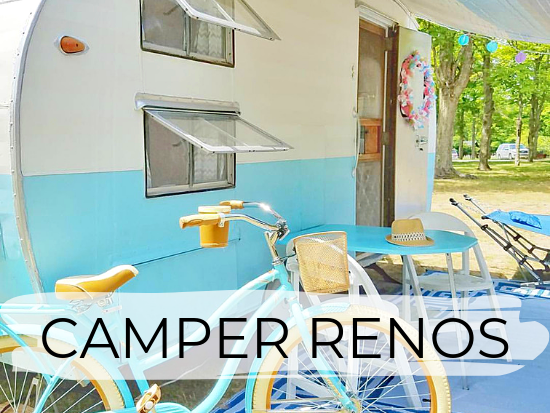 Your reno is amazing. 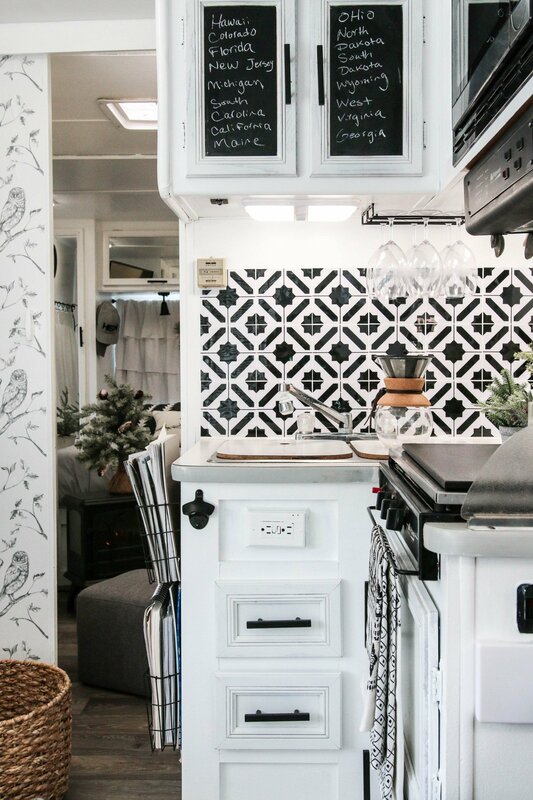 I am in the market for a travel trailer and I just love your decor. 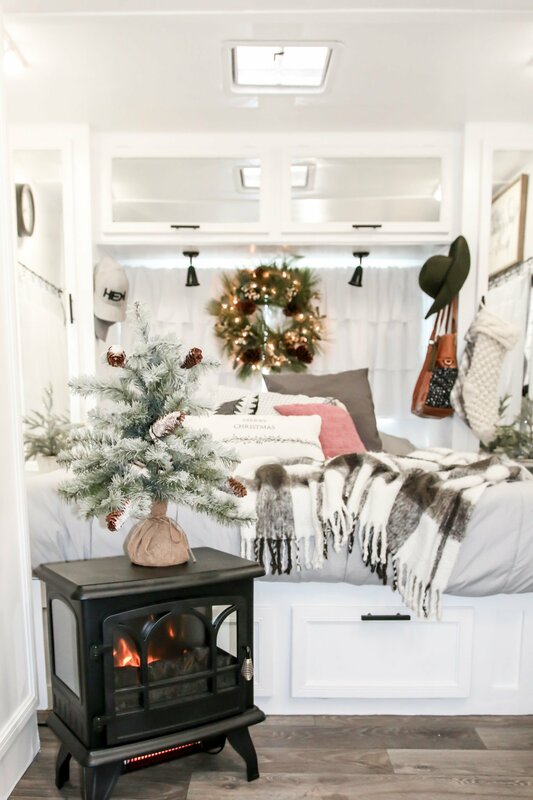 Will you please tell me why model camper is the one featured in Cozy Christmas in the Camper? Hi Jackie! Thank you so much! I’m not sure I understand your question though? Sarah that is the most quaint and beautiful Christmas camper and the little ‘wood stove’ heater is my favorite accessory. 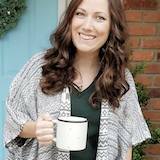 You should be so proud of this makeover, it’s amazing! 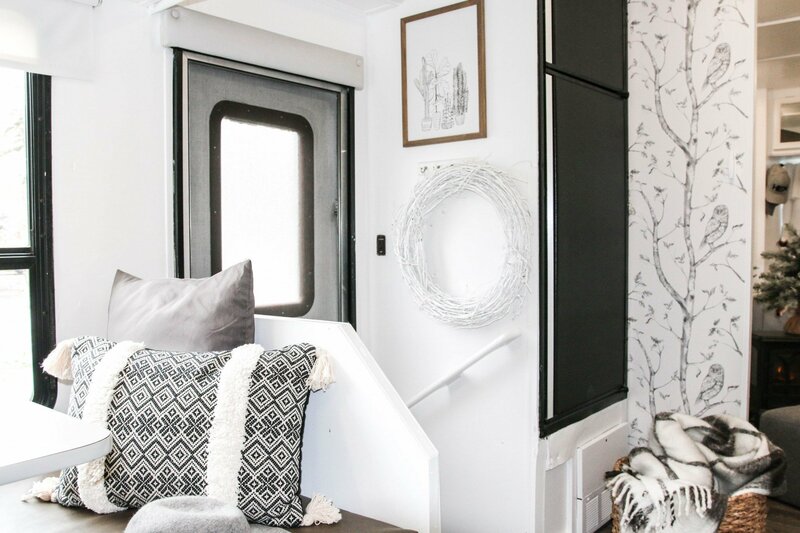 Your camper looks so cozy and fun! 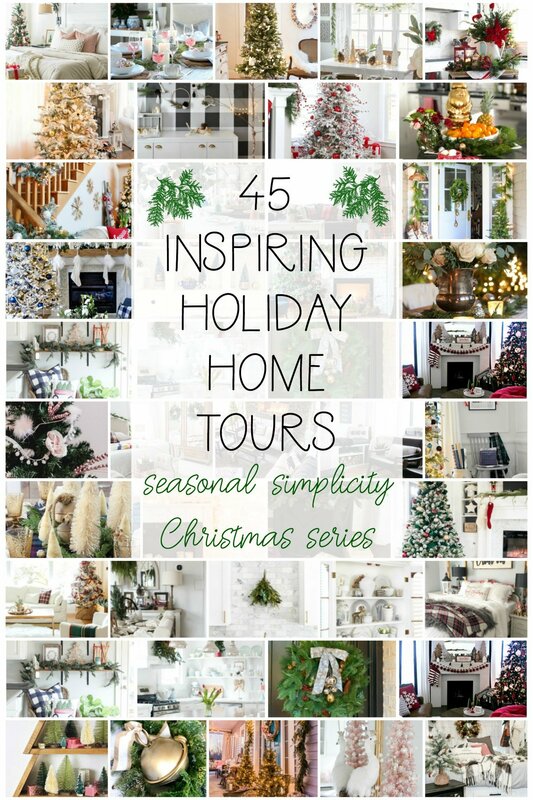 Thank you for sharing on the home tour.